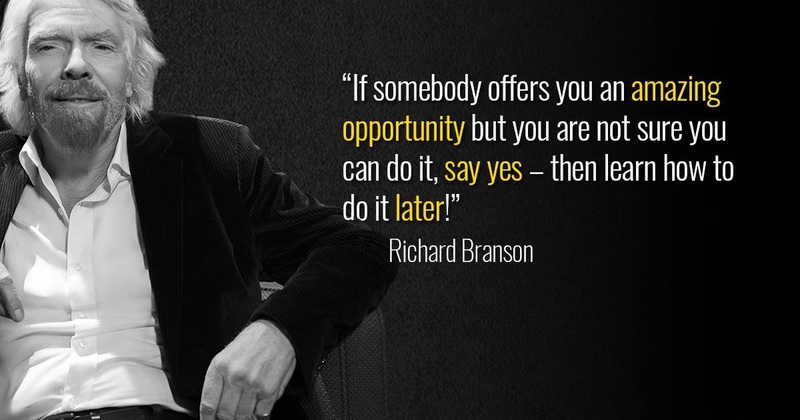 This quote by Richard Branson still inspires me. Way back in the early 90’s I was working as a PA to the Marketing Director for just about the best employer I ever had (and there have been some greats). I don’t think I’d ever really heard of marketing back then and certainly never planned a career in it. However, it was a small business growing fast and it was all hands to the pump. I was asked if I could plan and organise trade show attendance overseas. If being truthful, at the time I was probably more interested in the glamour of an expenses paid trip abroad which spurred me into a brave “yes”. But I surprised myself. Loved every bit of it and went on to do many more besides. Having uncovered a previously unknown talent they then sponsored me to do formal CIM training which meant I was still able to gain experience in the “day job” and also qualify as a marketing professional. Very hard work at the time, but hugely satisfying. Since then I’ve been lucky enough to continue to work with many companies, large and small, often needing needed an injection of hard work, boldness and bravery to help them leap towards achieving great things. Thank you Telsis. Without you I wouldn’t be doing what I am today. September. Took a leap of faith and left the relative safety of a regular salary and corporate life to go it alone. Won first customer! Start of the financial crisis. Initially a bit of a worry, but turned out to be the making of the business. As the IT channel needed to reduce costs, they still had to keep the lights on and favoured outsourcing much more. Plenty of great talent released to the job scene to work with us too. Ahead of the curve on that thing that’s now mainstream – marketing automation and lead nurture. Upped our game and trained the team in Eloqua, Pardot, Acton, Hubspot, CommuniGator (plus a few lesser known ones). This has placed us in a great place as clients don’t always have the skills in house to successfully achieve great things with these tools so choose us to do it for them. Web design & Programming, events management, PR, copywriting. Developed our own channel portal for vendors and distributors allowing them to put co-branded assets into the hands of resellers, spin out landing pages, deliver lead alerts, manage incentives and rewards and manage reporting all in one simple tool. Yin and Yang with this one. Whilst the downside is the investment (especially time) in systems and processes needed to ensure compliance, the upside is all clients have to think about looking after the data they have and use it for delivering great content to engage prospects in a journey to closing deals. Exactly what we do best! APP Development. Started managing and building app content for client that’s ahead of the curve….more on this soon.